Spartan of Chattanooga needed a brand new website. Their new mobile-friendly and responsive website is decked out with the Spartan Mower color scheme. 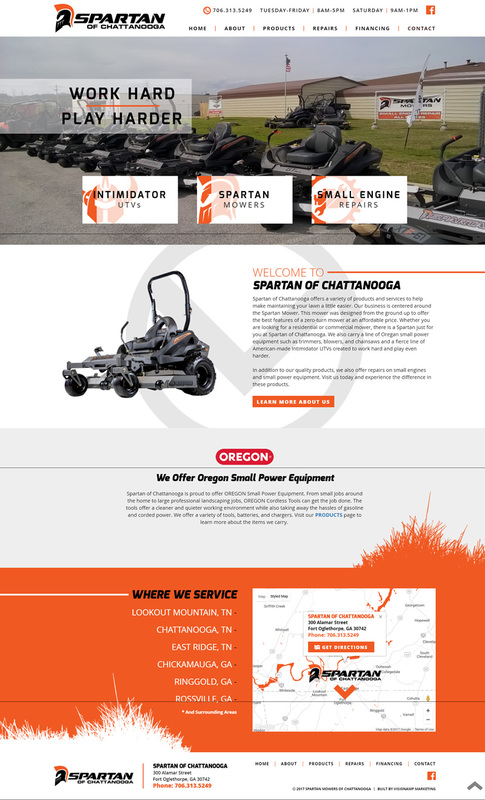 Clear navigation and buttons also make it easy for visitors to the site to find products and services offered by Spartan of Chattanooga. We also added a map of their service area on the home page with a button to help visitors get directions quickly. Spartan of Chattanooga offers a variety of products and services to help make maintaining your lawn a little easier. Products include Spartan Mowers, Intimidator UTVs, Oregon Small Power Equipment, and custom trailers. They also offer repair service on small engines and small power equipment.